Next weekend we will be having another Open Studios at the Farmhouse in Stevenage. Fairlands Valley Farmhouse is one of the studios managed by Digswell Arts for artists who are just starting out in their artistic career. 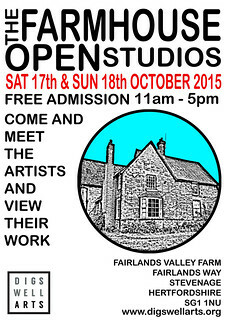 We will be opening up our studios to the public between 11am and 5pm on Saturday 17th and Sunday 18th October 2015. Pop in and say hello to the artists, see (and buy) some great artwork, eat cake and explore the Farmhouse and the garden.